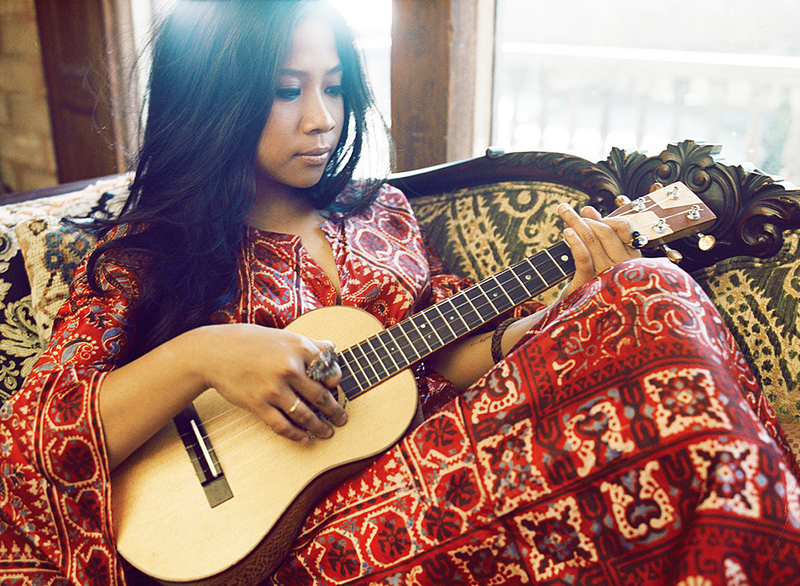 Zee Avi, a 28-year-old Malaysian born singer/songwriter, has had quite a successful music career. At 21, Zee began writing songs and publishing them to YouTube for a friend. One of her songs, “No Christmas for Me,” went viral and became a YouTube feature. The video was first noticed by Patrick Keeler, drummer for The Raconteurs, which led to a signed record deal with Jack Johnson’s Brushfire Records label and a publishing deal with Monotone (White Stripes, The Shins). Throughout her career as a young singer/songwriter, Zee has produced two successful adult records, was the first Malaysian singer to be included in Starbucks’ entertainment catalog, and has received high honors and awards for her musical abilities, one of which lead to inspirational speaking engagements for young kids around the world. Zee has also played at major music festivals (Rain Forest World Music Festival, Bonnaroo, Life is Good, Lilith Fair) and will be a featured showcase presenter at this year’s family music conference, KindieComm. Quite impressive! When I first heard Zee’s children’s debut, Nightlight(produced by Kevin Salem of Little Monster Records), I was taken by her soulful voice but also curious to learn more about her inspiration for making a children’s album. Zee was kind enough to take the time to answer some questions for me. Below we discuss an inspiring 8-year-old responsible for the adorable cover art, as well as how a karaoke machine and Joni Mitchell were childhood staples. Kids Can Groove: Your musical path started with a YouTube posting for a friend. Since then you have enjoyed a very successful musical career. What was your motivation behind posting a video for your first song on YouTube? Zee Avi: I believe it’s the same then and now. It was mainly to share my stories in the form of tunes. It was also a kept secret from friends and family (besides the one friend). In a way, they were journal entries that also provided a therapeutic outlet. KCG: At what age did you start singing and writing songs? ZA: My real love in the art of singing began when I was very young, as I was brought up in a household where the karaoke machine was our main source of entertainment (for me, at least). Although, I began really writing songs when I was 21. KCG: This album could easily serve as an album for adults. What was your inspiration for making a children’s album? memories. The inspiration behind some of the songs are from an 8-year-old appreciator of my music, and a bright young ball of love, named Mackenzie Mauldlin. She is also the artist behind the cover art, that was a surprise for her. KCG: How did you decide on the final song list? ZA: The collection of songs on Nightlight are both a mix of Mackenzie’s favourites as well as mine. Joni Mitchell’s “Circle Game” was my staple lullaby to sing my little brother to sleep when he was a baby. The “Lullaby Medley” contains a group of malay folks songs my grandmother used to sing to me, and I decided on Velvet Underground’s “Who Loves the Sun” because I had to pay homage to one of the songs that led me to song write. KCG: Nightlight is made up of cover songs. Had you thought about using some of the songs from your other albums? ZA: My third album is currently in the works, which means there are songs that would’ve been contenders for Nightlight, however, Nightlight has such a wondrous tone and swatch within itself already and has such a bright personality that I decided to preserve that. KCG: One of the things that I love about the album is that you stayed true to the lyrics in the songs you chose to cover. For example, The Velvet Underground’s “Who Loves the Sun” and Joni Mitchell’s “The Circle Game.” Did you second guess that at any point? ZA: I did indeed for “Who Loves the Sun,” but as the recording went on, it felt right for it to be there. This was one of the songs that led me to realize that ‘love’ itself can be longed for in many ways. The song taught me about irony in the most gentle way, so I had to share that. As for Joni Mitchell’s “Circle Game,” it was no question. In fact, that was one song that came up first in the recording process. I love Joni Mitchell’s ideals and values. “Circle Game” brings you on a journey of growth while at the same time it teaches you that the only way is ahead, though sometimes it’s alright to look to the past in order for you to recognize your present in all blessed ways. KCG: How would you describe your style for those who are new to your music? ZA: I always say I write music that makes you feel like pancakes. Either it makes you want pancakes, or feel like you are one. Warm and cozy. Haha! I am such a young artist who is still learning and evolving and who knows, I might write music that makes one feel like barbecue sauce soon. KCG: Do you have any thoughts for kids/families writing music with the intent on publishing? ZA: I will always be a student and a learner of all my experiences, and if this experience leads me to that..why not? I will definitely give it a try! For more on Zee Avi’s Nightlight, read the full album review here.